Jenks | Family Entertainment That Really Rocks! | News : My Air Shark! I hope you all are doing well. It's been a busy and exciting spring for us. My wife and I had a baby in May, making for 3 little girls in the Jenkins family. I've also been hard at work writing and recording some new music, which leads me to some great news. We have a new album coming out in the fall! It's called "High Five a Dinosaur" and it features songs about dinosaurs! Pterodactyls, cave men, disco music, raptors, it's all covered! Please share the video with your friends, post it to your Facebook wall, or throw open your living room window and tell the world about it! One thing we've added to our list of shows is wedding receptions. We've played a few receptions this spring, and have had a blast doing it. If you're looking for a good group to serenade the bridal party, then let us know! Make sure to like us on Facebook so you can keep in touch with all our news. We're constantly adding pictures and video to keep you entertained. Keep on rockin' Jenks fans! See you at the show! 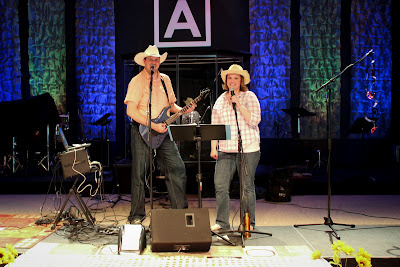 Rockin' Real Life Ministries' daddy daughter hoedown, June 15, 2012.